Breaking (Bad) news: Marketers LIE! I know it sounds like heresy, but I’m here to break bad news: marketers lie. Most specifically, they lie in their advertising. They’ll do or say virtually anything to GET YOU TO LOOK OVER HERE! It’s nothing new. They’ve been doing it for decades, from omitting “unnecessary” items on their package labeling, or touting offers that get negated in 30 lines of 5 pt heavily kerned knockout legal copy. And it’s hard to avoid. Because in many instances, the competitors are lying too. So some awfully nice marketers are often forced to join in the lying spree to make sure YOU LOOK OVER HERE TOO! Case in point: Century 21, the national real estate broker, recently perpetrated an outright lie to draw attention to their brand. Wanting to capitalize on the enormous popularity of the AMC TV Series Breaking Bad and tie in to the September 29, 2013 series finale, and seeking a solution around the enormous costs associated with advertising on the show, they opted for a more, um, unorthodox solution. 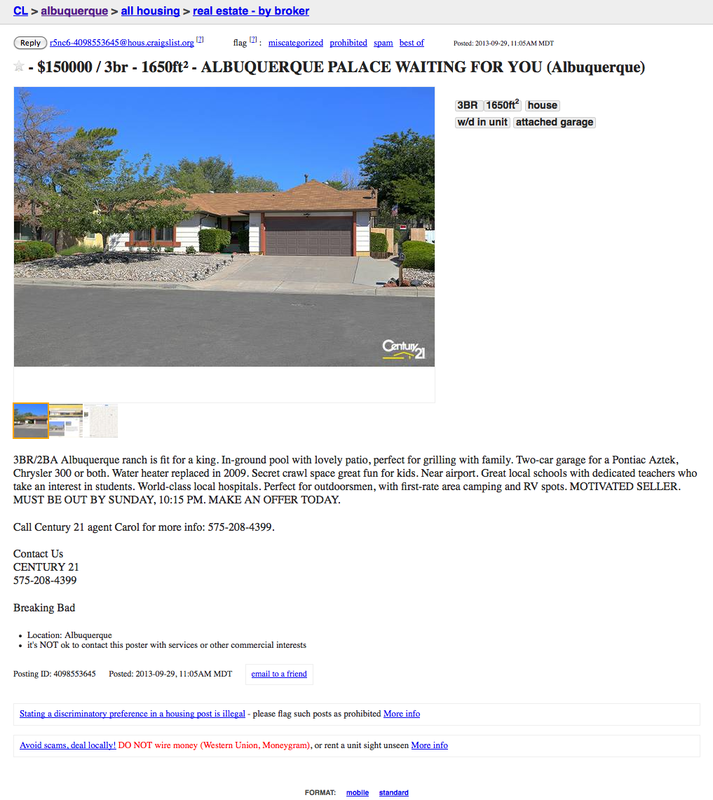 Century 21, and their agency Mullen, ran the below ad in Craigslist, listing fictional character Walter White’s Negra Arroyo lane ranch. Pretty neat, huh? It’s a funny and quirky idea that leverages the popularity of the show. And they make no bones about it: the ad is a farce. It’s laced with Breaking Bad references, and inside jokes about how there’s nearby “RV spots” and a “motivated seller” who must be out by 9/29. Let’s face it. It’s pretty funny stuff. But it’s also an out and out lie. And here’s the thing – they may have misled some people in the process. I commented on the AdAge article about the stunt and surmised that there may have been 117 people who actually clicked on the ad interested in this home. (Seriously, a 3BR ranch in a nice neighborhood for $150K listed by a reputable broker would MAKE ME LOOK.) And let’s say that 20 or so of those people immediately understand that it’s a Breaking Bad riff, and get a good chuckle out of it. That’s 97 misled people who MAY now have a bad taste in their mouth about the brand. Brands have a hard enough time trying to maintain their personalities among competition, economic trends, and other market forces. So it’s ill-advised to pull out the rope-a-dope in the hopes of creating fans. While this is all important legalese, it ultimately dilutes the power and appeal of the original promise. So as a consumer, I’m left holding the bag on a flight I don’t even want to take, on days I don’t want to fly, just to try and save a few bucks? No thanks. I’ve written many times that brands are very delicate entities that are built over time. Most importantly, one of the primary aspects of a brand is that it is a cumulative phenomenon – the perceptions and overall impressions are built over time into what you ultimately believe about the brand and its promise. And when brands start lying to me about virtually everything, (even as a goof,) those perceptions start to erode. And as a consumer, there are so many “shiny new things” out there, that I’m likely looking for another promising offer within 2 minutes. Take note Century 21 and JetBlue and any other brand that’s still using snake oil salesman tricks from 100 years ago. It’s a new consumer overloaded with choices. You can’t just break bad and expect it to keep working.